Tenerife weather. The island is also known as La Isla de la Eterna Primavera, which means "island of eternal spring" and Tenerife is just that. Summer and winter show very little difference in temperatures, with the island being blessed with constant, sub-tropical fine weather. Although some of you are aware that Tenerife lies off the west coast of Africa, it may not have occurred to you that it actually shares the same latitude as the Sahara desert! This goes some way towards accounting for the temperate climate. Tenerife weather temperatures vary from a winter average of 20° - 22°C to a summer of 26° - 28°C and there is generally sunshine all year. I know there'll be some of you who've visited in the winter and had no sun to speak of - and this can happen every so often. In fact, during our last visit, it was cloudy more or less the whole time, that is, until the day we were due to fly back to the UK...then it was glorious sunshine! Usually, though, you can rely on good weather, whenever you go. Los Cristianos, looking like it might rain! 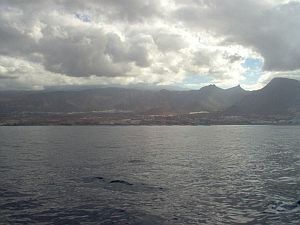 Tenerife weather is controlled to some extent by the humid tradewinds, which, when they reach the north/northwest, condense and turn into high banks of cloud. This, together with the cold sea currents of the Atlantic Ocean and the island's distinctive topography of mountains and valleys, create major differences of climate in various regions of Tenerife. 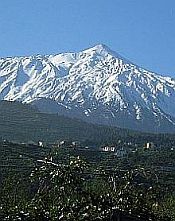 In winter, you can be basking in sunshine on the south coast, when, a few miles away, at a higher altitude around Mount Teide, there'll be snow! Such are the stark contrasts in the weather of neighbouring towns that Santa Cruz, say, can have a generally warm, sunny climate all year, whereas the town next door, La Laguna, is considerably cooler, with a greater chance of rain. The biggest contrast is between the north and the south. Over three quarters of the rainfall on the island falls on its northerly windward side and, the further north you go, the greener the landscape gets. Every so often, Tenerife gets a true, honest-to-goodness shower of rain. The good thing is, it rains like mad for a short while, then that's it - back to the sunshine! Sometimes, the atmosphere can turn quite oppressive and a very hot wind starts up. 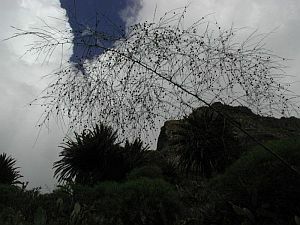 This is the calima, blowing over from the Sahara Desert. It's a bit like the famous wind, the Sirocco and is formed when high pressure builds up over Northern Africa. A passing cold front north of the Canarian archipelago draws material from the Sahara and creates a strong, hot wind, laden with sand. In an extreme combination of conditions, a depression can form south-west of the Canaries, which can increase the intensity of the calima. On these occasions, all of Tenerife can end up coated with sand, with greatly reduced visiblity. In 2002, things were so bad, the airport had to be temporarily closed. Click here for a detailed weather forecast.